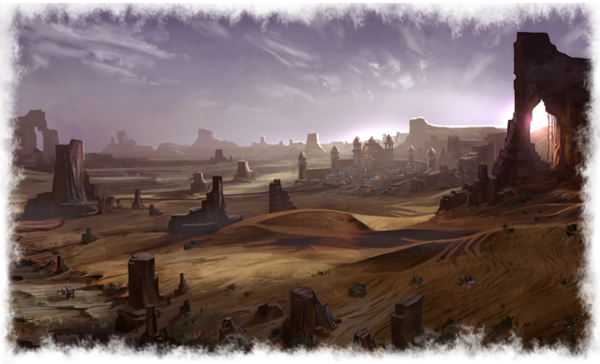 The arid wasteland west of Colovia and south of Iliac Bay was an abandoned realm. During the First Era, the Aldmer referred to this desolate places as "Hegathe" and the Nedic people called it "Deathland." Stifling, sandy winds clogged explorers' lungs, while baking rocks branded their feet. The only footprints to be discovered were made with the scaly hooves or claws of terrible monsters that stalked this land. So it is to the credit of the Redguards that their banishment to these shores paid dividends, and their adept adaptation to this new homeland resulted in a powerful province and a new mandate. 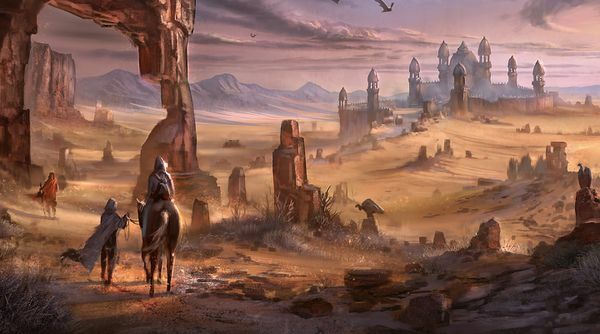 This is Deathland no longer: This is Hammerfell. During the First Era, the city of Sentinel was a simple outpost, a show of force and protection against Orc marauders, Goblin raiders, roaming trolls, cattle-sized scorpions, and other more terrifying spirits that dared enter High Rock. 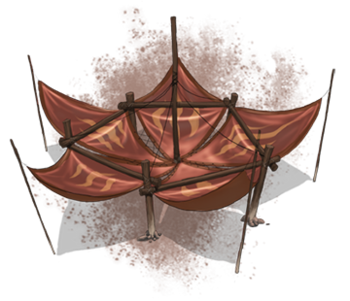 But the Redguards were not the first to settle this desert; a Dwemer faction known as the Rourken disagreed with the Chimer and Dwemer alliances in Morrowind and moved into the Deathlands, trading with the southern Elves and northern Bretons alike. They sanctified their capital as Volenfell, or "City of the Hammer." 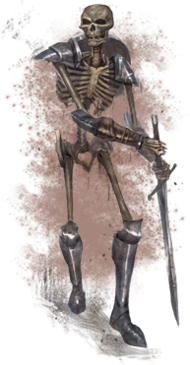 Despite their attempts to distance themselves from the War of the First Council, they paid the price of all Dwemer, and the Rourken disappeared. 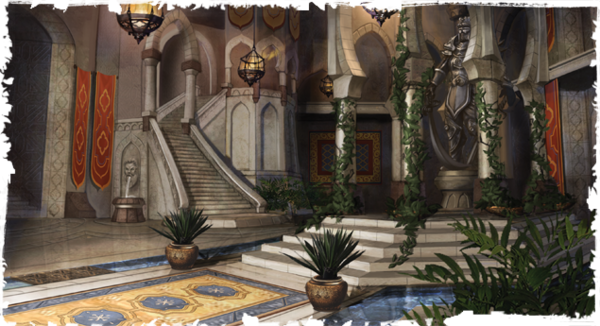 Almost overnight, the Dwemer capital was among Deathland's empty cities. Only ghosts and creatures from the inland desert roamed the old alleyways and empty buildings, interrupted by the looting of Abecean and Nord pirates. To this day, Volenfell lies buried and silent under the Alik'r's boiling sands. Compared to the temperamental Bretons, the Redguard race seems positively dignified. Standing broad-shouldered and tall, with dark skin and wiry hair, they are seemingly born with a sword in their hand. I spoke with a few of them and found them formal, obsessed with personal honor, and quite aloof. While Breton culture had felt almost familiar to an Imperial like me, seeing the glinting domes of the city-port of Sentinel on the horizon gave me no such comfort. The Redguards were people from another continent, and it seemed they'd brought as much of Yokuda to Tamriel as they could manage. Like a swarm of slaughterfish, the Ra Gada armada tore along Tamriel's shores as the Yokudan invasion began. Furious fighters with nothing to lose - their own archipelago was lost to the western seas - they brought swift death to coastal colonies of unprepared Breton and rampageous Orc folk. No compromises were made. 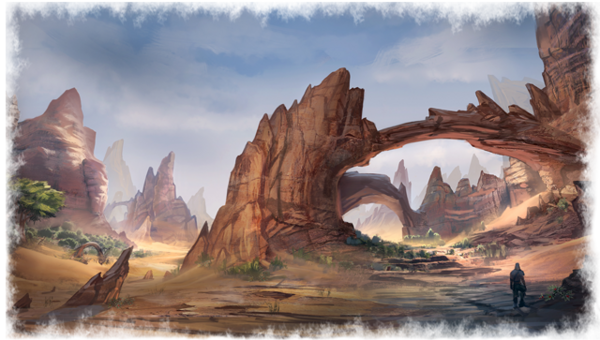 The province of Hammerfell and the Na-Totambu government of the Yokuda -- who became known as the Redguards -- thrived. Customary farming practices and religions flourished, even in the arid climate. 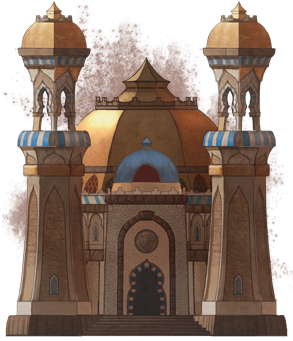 These swift victories and the quick construction of Sentinel, with its numerous high-domed structures (resplendent with mosaic adumbrations) on the shore of the deep desert, startled Elf and Man alike. While the Bretons nursed their wounds and pride, the Redguards defied their hard desert surroundings. It took more than 100 years and the rise of Orsinium for the Bretons to suppress the Redguards' violent arrogance; this galvanized an uneasy truce and began economic relations. Time heals even the deepest wounds. 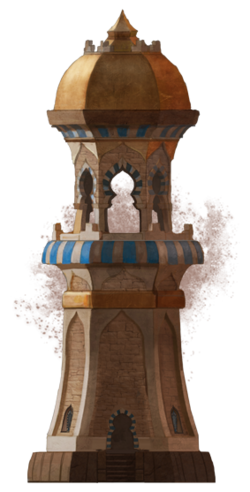 The recent Daggerfall Covenant is holding, and although outer regions of Hammerfell remain distrusting, the city-states of Sentinel and Hallin's Stand are committed to fight with King Emeric of Cumberland. The social hierarchy of Sentinel (the Forebears) is well versed in diplomacy with High Rock. But standing shoulder to shoulder with the Orcs tests the Redguards' commitment and honor to the snapping point. So far, both factions have kept their word (although interracial tasks are undertaken with gritted teeth and stringent overseeing). Although the Redguards are fewest in number, the Covenant seems obliged to prosper from their influence, from the tactical expansionism of the Forebear king Fahara'jad to the calculated war-planning of his generals and maritime adeptness of this sailors. Frandar's ilk were artisans who valued beauty in the smithing of magnificent blades tempered with magic. But even more intense devotion to the gods of war allowed them to use their minds to conjure swords of insubstantial light. Those Ansei with otherworldly piety took this further, changing light into substantial, bone-cleaving reality. Disarming such an Ansei now required severing their head. Hunding's Shehai slew entities both wondrous and monstrous. After the defeat of Lord Janic and his seven lich guardians, Hunding retreated to the Hattu Mountains. Now invincible, he spent the next 30 years crafting his learnings into the Book of Circles. As Hunding readied for death, his hermitage was finally interrupted when his people called upon him. Being roughed up by a crazed cultist is grounds for annoyance, but being browbeaten by one of my own kind is tantamount to treason! I'll be sure to inform Chancellor Tharn of his transgression. But for now, I won't let one rotting larva spoil my scrib pie, especially as there's so much to see, and paint, in the bustling streets of Sentinel. The architecture is breathtaking! I was expecting cracked and crumbling huts, but the Fighters Guild is majestic and it features cleverly-designed flumes for ventilation and insulation against the baking heat and cloudless nights. Masons of some considerable skill erected these monuments to an otherworldly kingdom. I hate to write this, but our architects could stand to learn the ways to move air around our homes: My bedroom in Bravil is a tad close to the guardhouse latrines for my liking. Farther into the indescribable heat we go. I kept to the middle of the procession, and with good reason. From over a dune, I spotted an immense scuttling creature race down to the desert floor. 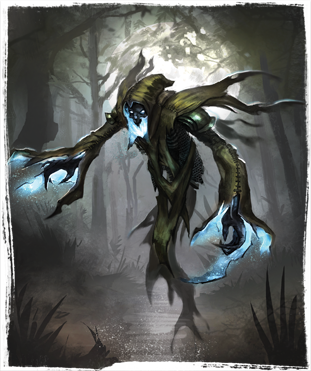 An old man of the Ash'abah who was wandering away from the group parried valiantly but was seized by the fiend's giant claws before a horrible skewering took place. 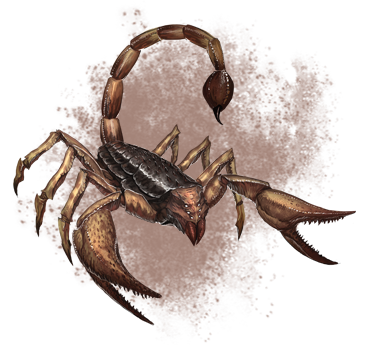 The Ash'abah huntsmen immediately tracked the colossal scorpion and surrounded it with shields aloft, and one brave soul leaped for the tail, incapacitating the beast before they set upon it with a flurry of blades. I sketched the fight for posterity. The old man may have died of his wounds, but we ate a palatable stew of scorpion meat that night. 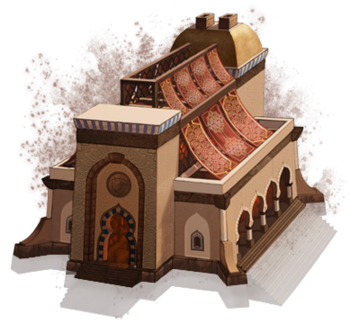 Speak to the Imperial stonemason who has rebuilt naves, walls, and crenelations after a raid on a Cyrodilic building, and he'll lament the difficulty in repairing such heavy and ornate stone. While much Imperial construction requires demolition and rebuilding after conflict, many of the Yokudan accent pieces, such as the flying staircases or ornamental domes, are designed to crumble after an attack or an earthquake; this allows them to be easily replaced in sections afterward. However, these structures are solid; they stand tall and firm despite the sweltering heat. But it doesn't take an architect to realize these structures reflect the original home of the Redguards. The many outer fortifications to this settlement are a sight to behold. The wall the defends Bergama is both ornate and substantial, with numerous foreign flourishes I've never witnessed before. While a Nord stable might be little more than a sturdy wooden barn, the Redguard stables are positively opulent but practical. The pavilion tent roofs can be retracted during a sandstorm and draped again to protect animals from the sun. All without compromising ventilation. Ingenious! After my wine, I placed a talisman to improve bartering around my neck and strode confidently into Bergama Market, still bustling after dark. Amid the bleats of goats, the shouts of robed outcriers, and the smell of meats and incense, I stopped first at a small blacksmith's stall to purchase additional weapons. Try as I might, I couldn't secure a bargain. I fared little better at the herbalist; the dried herbs, other roots, and reagent powder I gathered were twice the price compared to Wayrest! Even a deal on waterskins eluded me. I explained away my drunken bartering to the Ash'abah, telling them the recent turmoil in Tamriel caused prices to soar, and we set off at dawn to make for Tu'whacca's Throne. Barahar informed me the tribe was duty-bound to visit there to perform the annual Rite of Royal Rest, which seals the Redguard kings and queens into their tombs and keeps them happy in the afterlife so they aren't tempted to return and rule from beyond death. At least, that was the theory. Tu'whacca's Throne is more than a simple sepulcher; it is a terrifyingly vast monument to the dead. No wonder the ritual is important-there are enough buried dead to summon a city's population of undead! As the Throne Keepers retired from the ruins for the 36 hours the rite took, I was stopped at the entrance, a sack was placed over my head, and I was left to meditate in a goat pen. Apparently such rituals are not for the eyes of an outsider. Despite the smell of dung, I was content to wait. I'd been having flashes of memories from the last time I was in a mausoleum, and my chest brand itched in unison. Marimah was being prepared by his priests for combat with the revenant. Barahar pushed past the huddled villagers and fired barbed words at me: "This ritual requires the sacrifice of four white sheep." She held out her hand for payment. I offered her one of my genuine prayer wheels and she spat on the ground at my feet. I gave her a gold ring and waited for the skirmish to commence. My guilt was immeasurable. 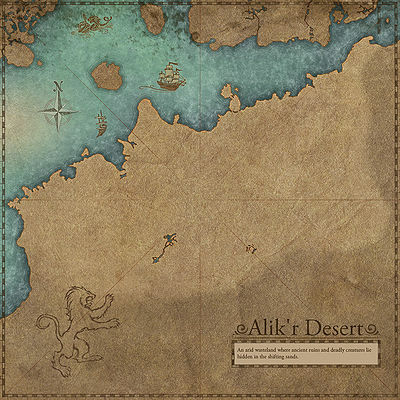 The desert outpost of Leki's Blade was built in the First Era around the shrine of the same name. 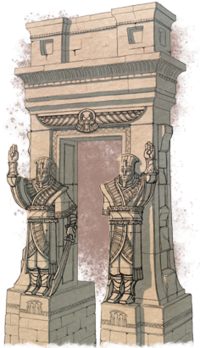 Hewn from local materials, the huge statue of the gripped sword still serves as a navigational point, an idol and marker for the Redguards to witness on the pilgrimage to this place. Local scholars may argue over certain details, but it is certain that Leki's Shrine was established by the last of the Ansei as a training temple, where their sword knowledge could be passed down to later generations. Today, Redguards travel from the four corners of Hammerfell to study under the broken blade. From the young child who learns focus with a blade, to the adult warrior who seeks further prowess and meditation, to the master who yearns for final instructions, all seek tutelage here. Local myth claims that the spirits of the departed Ansei watch over the hearts and desires of those training in this temple. The Ansei, known as sword-singers, recruited members to their order at age 11, and males became known as "Brothers of the Blade" while females earned the title "Maidens of the Spirit Sword." The most famous Ansei is Frandar Hunding (whose life and tribulations can be found in Appendix 13).